Canada’s largest city, Toronto, is the site of Rotary’s biggest event of the year, the annual Rotary International Convention. More than 24,000 registered participants from 175 countries and geographic regions have come together to renew friendships, find inspiration, and immerse themselves in the many cultures for which Toronto is famous. RI President Ian H.S. Riseley opens the 109th Rotary International Convention. Her Royal Highness The Princess Royal, Princess Anne, addresses the 2018 Rotary International Convention on 24 June in Toronto. In welcoming Rotarians to Toronto, Chief Stacey Laforme, Leader of the Mississaugas of the New Credit First Nation, noted how Canada is known as a country and Rotary is known as an international organization that supports those around the world in need. “Honestly from my heart, I tell you the Indigenous Peoples of this land and the rest of the world are in need. Stand with us, work with us, and walk with us." Before the regular program: A tribute to Sam Owori, who passed away a few weeks into his year as president-elect in 2017. President Ian Riseley presented his widow, Norah Owori, and son with a Rotary Award of Honor for Sam posthumously. 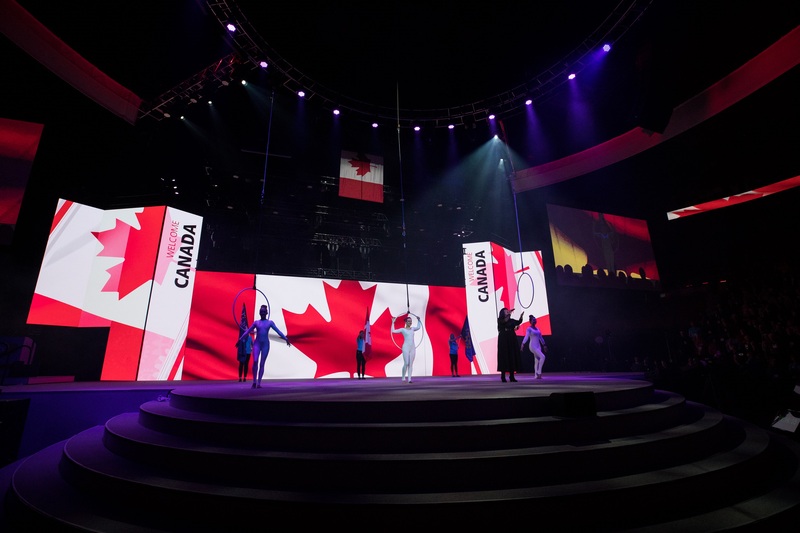 The convention’s opening ceremony took place Sunday at the Air Canada Centre. Chief R. Stacey Laforme, of the Mississaugas of the New Credit First Nation, welcomed Rotary to Toronto, while RI President Ian H.S. Riseley reflected on the diversity that both Rotary and Toronto value and celebrate. This is the fifth time the convention has been in Toronto, second only to Chicago in number hosted. Her Royal Highness The Princess Royal, Princess Anne, made a special appearance during the opening ceremony. The second child and only daughter of Queen Elizabeth II and Prince Philip, the Duke of Edinburgh, the Princess Royal is president of Save the Children UK, an international nongovernmental organization that focuses on health, education, protection, and disaster relief for children. A strong advocate for children’s rights, she travels the world in support of Save the Children and other charities and causes. Over the next four days, attendees will hear from former first lady of the United States Laura Bush, an advocate for literacy, health care, and human rights, and Helen Clark, former prime minister of New Zealand and former administrator of the United Nations Development Programme. Bush is the wife of George W. Bush, president from 2001 to 2009. Other speakers include Dr. Tedros Adhanom Ghebreyesus, director-general of the World Health Organization; Ann Gloag, founder of the Gloag Foundation and Freedom From Fistula Foundation; and Caryl Stern, president and CEO of UNICEF USA. Monday through Wednesday, members will have the chance to attend breakout sessions where they will find inspiration for new service projects, polish their leadership expertise, and learn skills for building stronger clubs. Fellowship is the biggest part of any Rotary Convention, and the week wouldn’t be complete without Host Organization Committee events welcoming attendees to Toronto, showing them the city, and giving members a chance to get together and socialize. Follow all our convention coverage as the action happens. Find photos, videos, live blog posts, speeches, and more. Share your convention experience on social media with #Rotary18. If you can’t attend the convention, or are there but miss something, you can also watch a livestream of the general sessions and key breakout sessions, either as they happen or when you have time later. House of Friendship: The House of Friendship in the Metro Toronto Convention Centre began with a grand opening on Saturday morning. The bustling hall is where the Rotary world comes together to share ideas, advice, and project successes. Laura Bush, former first lady of the United States: The wife of former President George W. Bush will speak on her work as an advocate for literacy, health care, and human rights. Rotaract Panel Presentation: RI Director-elect Olayinka “Yinka” Babalola leads a panel of Rotaractors from Australia, Pakistan, and Uganda in discussing the future of the program during Monday’s general session. Rotaract 50th Anniversary Luncheon: Rotarians and members of Rotaract celebrate the 50th anniversary of the program from 13:00 to 14:30 Monday in Halls F and G of the Metro Toronto Convention Centre. ROTARYFEST: The Host Organization Committee is putting on a celebration of Canadian heritage complete with food, music, and a fireworks display at the Canadian National Exhibition Centre from 16:00 to 22:00 Tuesday. Food scene: If you are looking for an innovative place to eat, check out Toronto’s Kensington Market neighborhood, an eclectic mix of restaurants and cafes, reportedly one of the favorite food spots of Meghan Markle, Duchess of Sussex.